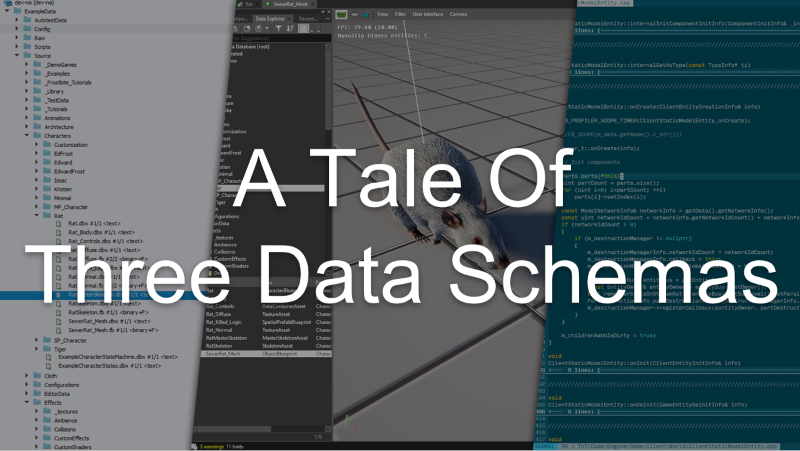 Next week I’ll be at the Game Developers' Conference, along with a lot of people from the video game industry, and I’ll be giving my first presentation there, “A Tale of Three Data Schemas”. I’m starting small for my first GDC contribution by presenting during the “pre-conference” days that half of the attendees skip. This year should be super interesting however since it will be a full day dedicated to the fine art of making game creation tools, courtesy of the fine folks at The Toolsmiths. The good thing for my nerves is that my presentation ended up being the very first presentation of the very first day – surely when half the audience is low on caffeine and completely jet-lagged, nobody will notice whether I know what I’m talking about or not… and then I’m done for the rest of the week! Yay!